Even though it’s Sunday, I woke up this morning at 6.38am, prodded and purred and meowed awake by our three hungry cats, for whom no day is sacred. With my boyfriend blissfully snoring away next to me, I was the lucky human servant selected to be roused in order to feed the three little dears. Comfort food was definitely in order for breakfast. INGREDIENTS – To every quart of milk allow 1–1/2 oz. 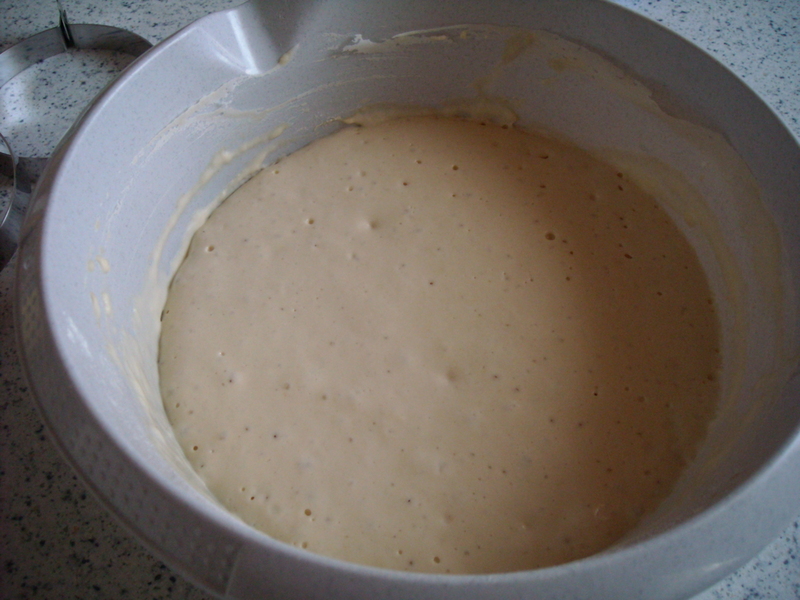 of German yeast, a little salt; flour. This was one of those foods that I never realised I could make myself – whenever I’ve eaten them in the past, it’s always been out of a 6-pack of crumpets. I don’t even think I’ve ever seen them on sale in a bakery before either, certainly in none of the bakeries I’ve been to in the UK or Ireland. 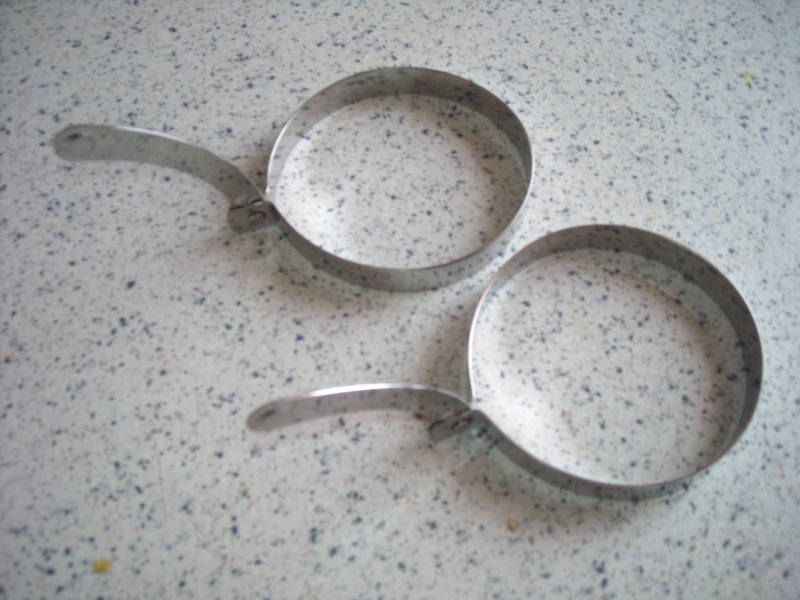 The first challenge was to find some “iron rings” to help the crumpets maintain their shape. Not an easy thing to do in Germany, as it turned out, at least, not where I’m living. I visited countless department stores and supermarkets in search of what I thought would be a commonly-found item. In the end, I found a 2-pack of rings for €8.99 in a central department store. If not quite what I’d been looking for, they at least did what I needed them to. They even came with cutesy-convenient handles to make them easier to use. The recipe calls for “German yeast”. I have no idea what this is, but as I live in Germany, I figure that any yeast I use is “German yeast”. Whether it was the country of manufacture or if the yeast I used cut through international boundaries, regular yeast was fine enough. I did a quarter of the recipe and found that 10g of yeast and a good 3/4 of a cup of flour to the cup of milk worked perfectly well. Unfortunately, I forgot the salt, as I realised too late to do anything about it. 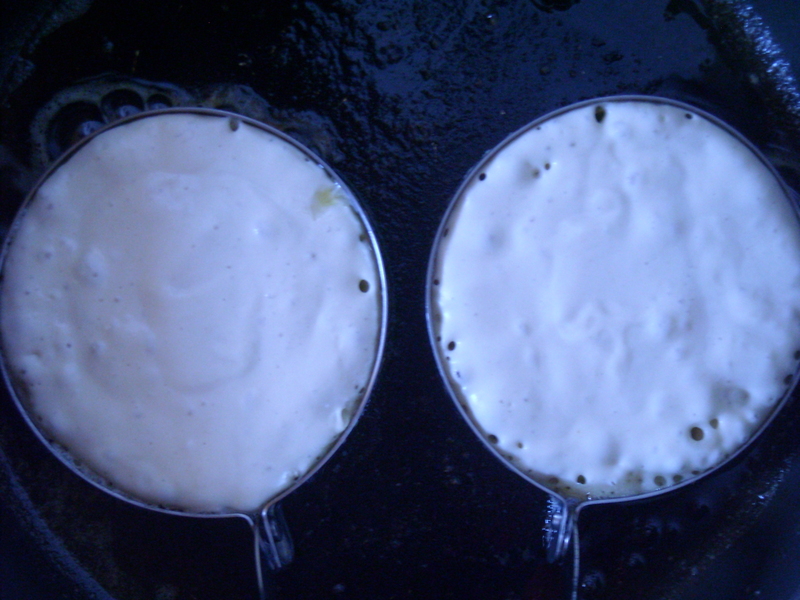 I left the mix to rise for approximately an hour, then poured some into the rings and fervently crossed my fingers. The first two I cooked at a medium-high heat, but realised that the base was getting brown and crisp (like a good crumpet should) too early, before the top had a chance to fully bubble and set. So I flicked them over for a minute before taking them off the heat. I cooked the next two at a medium-low heat and this kept the base a nice light brown and the top a dimply-soft perfection. The result? 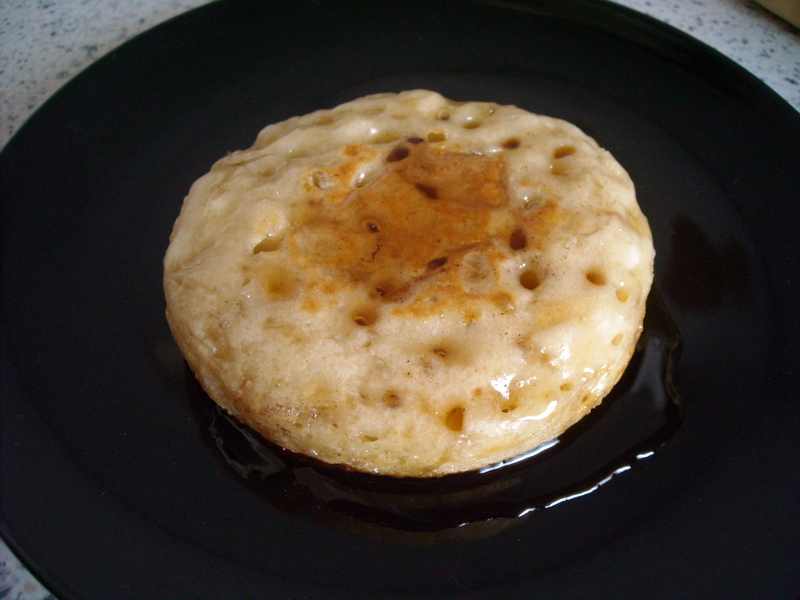 4 perfectly delicious, authentic-looking crumpets, made even more so by maple syrup (for my boyfriend) and honey (for me). They required very little effort preparation and cooking-wise, which perfectly suits Sunday-morning breakfasts. Despite the lack of salt, there was no noticeable difference to the taste. 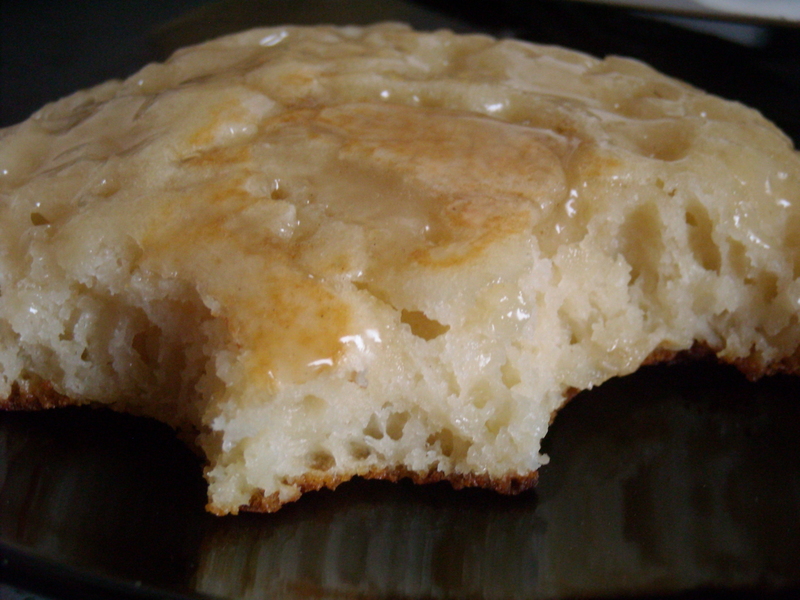 “What’s a crumpet?” my Canadian boyfriend asked me. I was genuinely surprised – aren’t crumpets universally-known? It seems not. It was wonderful to introduce him to something we both really enjoyed – I’ll never buy them in a packet again! This entry was posted on March 7, 2010 at 8:12 pm and is filed under food. You can follow any responses to this entry through the RSS 2.0 feed. You can leave a response, or trackback from your own site.